The first McDonnell Douglas A-4N Skyhawk II in flight. The name Skyhawk II is now used for both the A-4M and the A-4N. Sporting the newly-adopted pale blue overall finish for USAF air superiority fighters, the McDonnell Douglas F-15A was rolled out on 26 June 1972. Now named Eagle, it was expected to fly before the end of July. 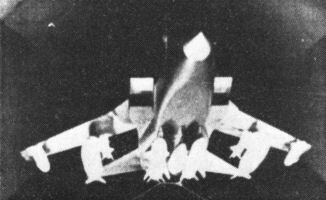 Shown undergoing tests in Aeritalia wind tunnel in Italy is a model of the Panavia 200 multi-role combat aircraft carrying a wide variety of stores beneath the fuselage and on four wing pylons.